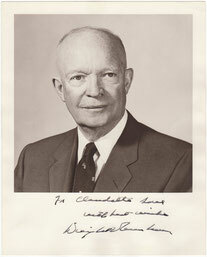 Typed letter signed “Dwight Eisenhower”. 1p., 6.75 x 8.75 inch, embossed “The White House Washington” letterhead. London, 1959 September 1. Addressed to Helen Lamberz in Wahn-Porz, Germany. In full: “Thank you so much for the lovely Meissen birds that you sent to me, along with your note of welcome to Wahn, when I was recently in your country. The piece will not only remind me of the warm hospitality of the German people and of my pleasant visit with them, but will also be a valued item in the small collection of such items the Mrs. Eisenhower and I have. I am indeed grateful for your thought of me, and I hope you will accept for yourself, and convey to the townspeople of Wahn, my greetings and best wishes.” Accompanied by the original mailing envelope, postmarked from London. Mailing fold, minor stain, else good condition. After his famous visit to Germany (August 26, 1959) Einsenhower traveled to London where he met Queen Elizabeth II. He flew back to the United States on Septemeber 7 after a short rest. Unusual letter written even while traveling.